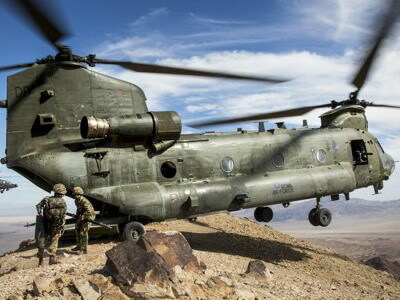 A Royal Air Force Chinook. Royal Air Force Chinook helicopters from RAF Odiham continue to support French forces in Mali on operations countering the ongoing insurgency there. The Chinooks have been transporting French personal to the forward operation bases as the French military conduct a changeover of troops. In addition, the heavy lift helicopters have been transporting supplies and equipment, the Royal Air Force (RAF) said on 1 March. “The ‘fat tanked’ Chinook Mk 5 is perfect for this role; even performing in this extreme environment operating towards the edge of its performance envelope it always delivers. We have trained hard for this op and it’s great to see that investment paying off; this is an important task and by flying French troops we are keeping them off the roads and helping sustain their combat operations,” said Williams. The RAF first deployed three Chinooks to Mali in July 2018.